Boulder, Colo. – April 12, 2016 – Backpacker Magazine, the authority on outdoor adventure, announces the launch of its 16th annual Get Out More Tour, a grassroots initiative to inspire and educate Americans about the skills and equipment they need to explore the great outdoors. This nationwide tour is full of inspiring stories, technical tips and hints to help with preparation and planning for hikers and backpackers of any experience level. The Get Out More Tour is traveling to more than 60 locations across the United States from May through November to bring the pages of Backpacker to life. 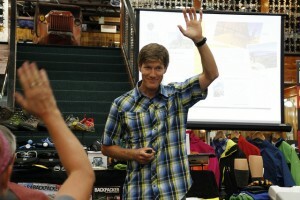 Tour veteran and outdoor expert Randy Propster is returning as the featured speaker this year, bringing his backcountry expertise and infectious love for the outdoors to the program. The Get Out More Tour will feature interactive and engaging presentations at specialty retail stores, consumer events and outdoor festivals. At each retail stop, Propster will lead a 75-minute seminar on trip planning, choosing the right outdoor gear and apparel, safety in the outdoors and much more. He will share trail-tested tips, as well as useful trip advice specific to each region. There will also be opportunities along the way for participants to hit the trail with Propster and test out gear provided by the Get Out More Tour sponsors. At each stop, participants will have the chance to enter to win great outdoor gear and apparel from sponsors including Osprey, Vasque, Sawyer, Kershaw, Night Ize, Green Goo and Farm to Feet. The Get Out More Tour kicks off on May 13th at the Appalachian Trail Days festival in Damascus, VA. Be sure to visit the Get Out More Tour website and Facebook page for the most up-to-date schedule information. Since 1973, Backpacker Magazine has delivered the outdoors to readers’ doorsteps, inspiring and empowering people to get out and enjoy nature more often. Backpacker, the world’s first GPS-enabled magazine and authority on backcountry adventure in North America, has won multiple awards, including a coveted National Magazine Award for editorial excellence. Backpacker is published by Active Interest Media.